I discovered the DentalTown forums recently, and the community there has confirmed what I’m discovering in my dental school student loan consulting business. The majority of folks who go to dental school today are setting themselves up for years of what is basically indentured servitude, not a life of “four day work weeks and driving a Porsche 911” as one user joked. My goal for this business is to help dentists make a plan to pay back their student debt for a low flat consult fee. Here are some examples of why the cost of dental education has to change if the profession is to survive in its current state. I’d love your thoughts too, please share them in the comments below because a lot of dentists, including my own, tell me that they wouldn’t let their kids become dentists. This has gotta be addressed. I’ve done five dental school loan consults for dentists who owe more than $500,000 each. Most of these individuals are specialists who allowed the interest to accrue during residency training by making low or no monthly payments. The average debt balance among these five people is $667,000. If that’s you, I can definitely help evaluate your debt to make sure you get on an income based repayment plan that might even offer interest rate subsidies and keep the total debt under control. You might ask how the heck someone could end up owing half a million bucks for a dental education. Unfortunately, it’s actually pretty easy. Go to a private undergrad and then go to dental school at a private institution. After that, pursue a residency in a major metropolitan area and borrow to cover living expenses. I’ve actually had some clients whose dental school debt approached $1 million because of reasons like this. These are specialists! If we rewind to the 1980s, these are the folks who are supposed to drive the newest cars, live in the biggest houses, and have plenty of money left over for a vacation house on the lake. We have left those days in the dust. If you told me before I became a dental school student loan consultant that it wasn’t unusual for a dentist to leave school with over $400,000 in debt, I would’ve laughed and called you crazy. Now I’m relieved if a general dentist comes to me owing less than $400,000. Private and public dental schools alike have massively increased their tuition and fees. One DentalTown participant wrote that his class had to pay $5,000 a year for books on CD. Another said they felt lucky to “only” have to pay the $2,000 yearly virtual library fee than no one used. If you go to dental school in a large city, it’s almost impossible now to come out with less than $400,000 in debt unless you 1) have a scholarship 2) have family help or 3) live like a pauper. If you have a strategy to minimize dental school debt while living in a high cost of living area, please let us know in the comments section. Obviously if you come out with $450,000 in debt and a $120,000 salary as an associate dentist at a corporate practice, you’re never going to repay that debt. 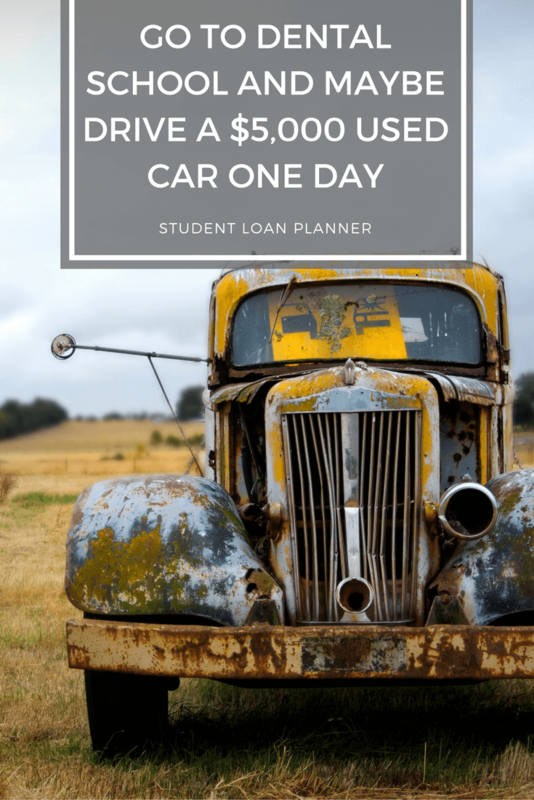 For someone like this, I help them select a repayment plan that will minimize costs, maximize subsidies, and determine how to save to pay the eventual tax penalty for private sector loan forgiveness. I even model what that cost could be under various income and tax scenarios. So Many Dentists Owe So Much in Student Debt, How do the Schools Expect You to Afford Anything? Obviously I’m being a little tongue in cheek with the title, but it conveys somewhat of a serious question at the same time. The economics of going into dentistry are becoming so bad, why would anyone go into the profession except because they just love what they do? If you have a huge debt load hanging around your neck, how do you take on more debt to buy a car, or a house, or even a practice? These are the questions my clients struggle with. If you go to dental school and come out owing more than two times your income, optimizing your student loan payback strategy is critical. This is a core function of what I do in dental student loan consults. I check REPAYE vs IBR vs PAYE and determine if you should switch to REPAYE for the interest subsidies even though you have $30,000 of accrued interest that would capitalize if you left IBR. I help you figure out how much you’d have to save in a taxable investment account to pay the private sector loan forgiveness penalty. Additionally, we discuss different options for managing your loans moving forward depending on your goals. There are still a few financially viable paths to obtain a dental school education without having to pray for government forgiveness programs to stick around. If you get a discount with in state tuition, you might be able to come out with around $200,000-$250,000, assuming you don’t receive any grants or assistance. A couple lucky souls in Texas might leave dental school with as little as $150,000 in debt from what I’ve heard. In terms of where to work, I’ve helped enough dentists to know that states like Utah, Nevada, Texas, Florida (outside of South Florida), Oklahoma, and the like still offer high economic rewards to dentists, especially those that successfully set up their own practice. If you fall into this category of low debt relative to income, then the right solution is refinancing wherever you get the lowest interest rate right away and paying the loans back as fast as you can. I have negotiated agreements with most of the major loan refinancing companies in the sidebar above. If you refinance through those links, then you get a cash bonus of $200-$300 in addition to the lower interest rate cost. Yes the economic state of the dental profession is bleak. Dentists who went to school 30 years ago have no idea how horrible the burden is currently of financing a dental school education. That said, the success stories are still out there. There would be even more of these stories if more dentists had a handle on their student debt. That’s why I want to help 1000 dentists make a plan to pay back their loans. Hopefully we can change the economic face of the profession so that the standard dentist car of the future isn’t a beater from the early 2000s. I can help you conquer huge dental student loans with a flat fee consultation. The average dentist I work with saves a projected $100,000 over the life of their student loans after doing a consult with me. We’ll solve the confusion of what the future looks like, including how to plan for a potential massive tax penalty if you owe more than double your income. If you owe less, I’ll help you find the best refinancing deal anywhere. I have a huge loan debt. Anysuggestions or advice is greatly appreciated. One general question I do have is- is it smart to start an S corp our first year out? Or would it be more beneficial to wait untio we are getting a full years salary? Funny that you would put Utah as a place that offers high economic reward for dentists when it has the lowest reimbursement rate for procedures in the country. Must be a major typo? I think my supposition there was based on a convo I had w a dentist far from salt lake. Happy to change that for accuracy thanks for pointing it out. Can you link to something for me to check that out? Could you explain the benefits/ downfalls of a PLLC vs S corp? Unfortunately Brandon I’m not a tax expert. Most of the dentists I’ve spoken with have used the S corp designation, but I’d highly encourage you to contact a CPA who works exclusively with dentists. Jonathan Van Horn of Dentist Metrics is one of the better ones I’ve encountered and I believe he works nationwide. Brandon,(Disclaimer I am nto a lawyer or a CPA so this is just my understanding of the subject) a PLLC is a legal entity which separates you personally from liability of the business. S corp is a taxation category. So in other words you can be legally a PLLC and categorized as an S corp at the same time.